How do you teach the average high school student that ‘nothing or no one’ can make anyone angry? Where does the ‘Bearded Bard of Stratford’ come into this preventative mental health caper? What has Shakespeare got to do with it? I was asked to talk to a group of year 9 students about constructivism, how we construct our philosophical views about the world, others and ourselves. These internalised ‘rules’ for living to a large extent determine how we respond to daily happenings. Students were very receptive to ideas that we construct these philosophies according to how we are genetically made and how we are socialised through family and friendships. We studied this excerpt from Hamlet, students taking turns to play each part and then we spoke about it’s meaning, what is Hamlet saying in the last statement? Act 2, Scene 2: A room in the castle. Hamlet: Then is doomsday near: but your news is not true. Let me question more in particular: what have you, my good friends, deserved at the hands of fortune that she sends you to prison hither? So back to Hamlet! I took the liberty of reworking Act 2, Scene 2 from Hamlet (apologies to the Great Bard) to give it an Aussie flavour on the topic of vegetables as follows. An Aussie take on Hamlet, Act 2 Scene 2 – a dining room in a house. Bruce: What bad luck that you are served such yucky food! Leeanne: Then are all vegetables so Bruce? Bruce: Yes all vegetables are yuck and broccoli is the yuckiest! Leeanne: We don’t think so Bruce. Bruce: Why then is it not true for you? Because there is nothing good or bad but thinking makes it so. To me it is yuck! This was a useful activity to acquaint high school students with the idea that nothing is good or bad but thinking makes it so. Thanks Mr. Shakespeare and Marcus Aurelius and Epictetus and Albert Ellis and Karen Horney and ............. Thanks! Sams Progress – It Ain’t So Awful Sam! Teacher: ‘We won’t let Brain Bully win will we? The next item to introduce to children is the idea that when we think something is ‘bad’ and we tell ourselves that it is the worst thing ever we don’t feel so good. We may feel highly anxious or angry or sad (Check the Emotional Thermometer). We may tell ourselves that ‘its so awful that we can’t stand it!’ This is called ‘Icantstandititis!’ a debilitating condition that can be treated by understanding and using the Catastrophe Scale (CS). The CS is a list of possible/actual concerns which are organised according to how ‘bad’ they are. Children will then be able to see at a glance that an itchy nose is not as bad as the earth being blown to bits! Children respond well to this kind of learning and is a preventative mental health measure, teaching them that unhealthy negative emotions are made by irrational thinking (BB). If they know this they can help themselves to regulate how they feel and behave by themselves. This is what Rational Emotive Behaviour Education is all about. Sam will learn that when she believes small problems are not so bad after all she will be less inclined to anger and will be a happier little person. I know what I can do! Sam Feels Angry – Stew, Stew, Stew! Sam feels angry in class when she can’t get something she wants. Sam is six and has been at school for just a short time and her anger is stopping her from being successful. She gives up on tasks and just ‘has to have’ her friends hat which is newer than hers and she snatches it away! She isn’t making friends too readily and it’s hard to hold on to them when she does! She is bossy with others and is very insistent and demanding. What are her rules? What beliefs has she constructed that drive her unhealthy emotions and behaviours? What can the teacher do to help her in the classroom? Her teacher referred her to me (school counsellor) outlining her concerns for this student. I spent some time in Sam’s classroom and observed her at work and play. I could see why the teacher had concerns for her and so I met with her after school to talk about a plan to help Sam. I suggest to Sam’s teacher that I take some lessons in her class so others can benefit from some REBE learning and so I don’t withdraw Sam from her class and classmates. Over a series of five lessons I talk about helpful and unhelpful thinking. I call unhelpful thinking Brain Bully and helpful thinking Brain Friend. We make puppets and play games like Who’s Talking BB or BF? I make thinking statements like the following and children show if BF is talking or BB is talking e.g. This is an early introduction to Albert Ellis’ ABC theory of Emotional Disturbance for young learners. Ellis’ model shows the relationship between what happens, A (Activating event), my constructed beliefs, B and how I feel at C (Emotional/behavioural Consequence). Young Sam doesn’t know that her strong feelings and inappropriate actions are not so much caused by A but it is Brain Bully at B that’s causing her angst. This insight will help Sam learn how to control her feelings and make better behavioural choices. To summarise the last paragraph: A+B=C. In the next post we will see how Sam and her classmates are going and how the teacher will maintain the momentum of this learning into the future. The song below is about anger and what students can do about it. Oh me oh my what can I do? Now I don’t feel so blue! Sing to the tune of ‘Skip to my Lou’. Easier said than done you say especially when we are told that we are not responsible for how we feel on a daily basis. Listen to the news and it isn’t uncommon for an interviewer to ask an interviewee ‘how did this or that make you feel?’ Listen to the student at school who declares on leaving the classroom ‘I hate this subject it makes me so angry!’ or indeed the teacher who says ‘that kid makes me angry!’ This would reinforce the philosophy that distress is caused by things and events external to us i.e. you, it or events make our distress! We remain unenlightened by the wisdom of the stoic philosophers it would appear though we have had the educational tools and the opportunity to challenge the prevailing ‘not my fault’ modern day philosophy. Rational Emotive Behaviour Education (REBE) helps students examine whether someone or something can indeed make them feel anything! After all maths is maths and whether it makes you mad, angry or otherwise is up for debate. REBE provides the opportunity for students to explore why they feel and act as they do on a school wide basis (see previous posts). ‘I felt really angry because I didn’t get my way and it’s just not fair! After some discussion she acknowledged that her distress was due to her estimate of the situation, which was that it was not fair that she didn’t get what she wanted (it was making her mad). She understood that her anger was precipitated by her expectation that IT should not happen! This is progress in the ‘whose fault is it’ debate in the school context. We talked about cultivating a better way to estimate a situation, to think that it isn’t a catastrophe when you don’t get what you want and that you can stand it! She chose to revoke her belief that life must be fair and that sometimes you don’t get what you want. She changed her estimate of the situation and changed her distress. Marcus Antoninus would be heartened to know that Rational Emotive Behaviour Education is promoting his philosophy in schools. Young children have a great sense of the ridiculous and hence have fun with rhymes and expressions that are nonsensical and whacky. Appealing to their seemingly innate sense of the quirky helps to get across useful ideas and strategies that can help them in life. Having fun is important for you as well as your students and delving into the ridiculous is an end in itself I find! As an educator and counsellor working in the early childhood sector I have been known to dabble in the daft, query the quirky and to ponder peculiar prose! Spike Milligan was prolifically nonsensical and left us with classics like the Ning Nang Nong, which somehow appealed to our sense of fun. I never tire of the old Maxwell Smart reruns, laughing heartily at the antics of the eccentric Agent 86! And Tommy Cooper (if you’re old enough to remember) was altogether a unique individual who was a master of the absurd. Appealing to children’s ‘sense of the silly’ is a useful way to help young ones explore the topic of bullying in a fun way. · Introduce the topic i.e. what does it (bullying) look like, sound like and act like? · Why do others do this? Perhaps you can try this with my poem ‘You Are Dumb!’ and see how you go. For whatever reason people can behave unkindly and this is to be expected for life is unfair. Whilst we would like everyone in the world to be respectful and kind we can learn to accept that this cannot be so and we can practice Unconditionally Accepting Ourselves (and others). The poems message is that not everyone is mean, you are ok anyway and how people view you does not in the end define you! Little Max is a 6-year-old boy whose teacher has referred him to the school counsellor. His teacher is concerned that he seems agitated a lot of the time especially when other kids are not 'being good.’ When the teacher appears to be angry his concern is heightened. Max’s anxiety is stopping him from engaging in his learning and it is effecting his overall school experience in a negative way. Is that the way ‘he is’, his nature and he can’t do much about his natural tendency to experience anxiety a lot of the time? What is driving this extreme emotional discomfort and what can be done about it? He may have inherited a genetic predisposition towards anxiety and it may be a characteristic of other family members to a lesser or greater extent. He will also have ‘learned’ how to feel anxious, he may have been taught how to feel this way. As a counsellor I want to know what core philosophical beliefs has Max constructed that drive his anxiety, what does he believe? Where do we start? The teacher is on the ball and has raised her concerns about Max and the next step is for me to have a chat with he young person. It turns out that Max is a high achiever and wants to do well. He wants his teacher to think well of him and he feels upset when ‘bad’ kids ‘make’ her angry. What have I learned that could possibly cause Max’s anxious demeanour? · Other people and events ‘make me’ mad/anxious/angry. Max could do with some help to challenge and change these unhealthy, irrational core beliefs. 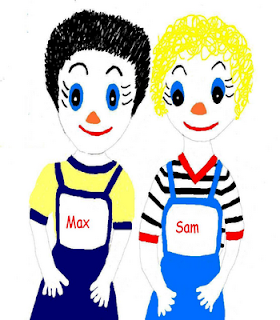 Max is a character in the popular early childhood Rational Emotive Behaviour Education resource ‘Have a Go Spaghettio!’ You will find many useful strategies in this program to help Max feel and act in helpful ways in the longer term.